I have recently returned from a highly informative, thoroughly enjoyable and action packed week at the eMetrics Marketing Optimization Summit 2008 in Washington DC. Since then people have been asking me, "What did you think? How did it go? What did you learn?" so here it is in writing. eMetrics would not be complete without a sampling of client-side case studies, and I knew that I would catch some at this conference. However, I was not expecting the case studies to be quite so inspiring and so motivating as they turned out to be. I had two favorites, both rightfully featured on the big stage as keynotes: James G. Robinson from the New York Times, and Joe Megibow from Hotels.com. James from NYT explained how the work he's doing in the online channel has influenced the offline channel at his company, and how his team has managed to convey the importance of web measurement to that wider audience. For instance, they found that they could use daily page views (yes, page views) on their web site to accurately predict the number of print newspapers they'd sell the following day. Pretty simple, yet a very effective way to encourage cooperation across diverse groups and spread the word about web analytics. Joe from Hotels.com described how his team has managed to fuse customer feedback and session-level customer experience data to identify and correct commerce flow problems on the web site. He gave great examples, and it's something that anyone with an online form (and isn't that everyone?) really ought to be doing at their own company. Joe also highlighted the work of his colleague Vernon, in the audience, as an ace developer of applications that the analytics team has been building in order to monitor their systems and notify them of problems. Now everyone wants to hire Vernon, or some rare individual just like him. I hope that someone (ahem) will post videos of the keynotes online. These stories need to be shared. As a theme I've seen evolving over the past couple of years, web analytics professionals are working hard to get buy-in from our executive teams. At this conference there were a couple of really articulate and important presentations on this topic. First, all-around great guy Eric T. Peterson gave a presentation entitled Competing on Web Analytics. It's an extension of Tom Davenport's 2007 book, Competing on Analytics, applied specifically to the online channel. Since his time as an industry analyst I've always felt that Eric has had a clear view of how the practice of web analytics can evolve, progress and grow within a company, and this latest presentation continues to build on that theme. Also, Liz Miller from the CMO Council gave a compelling presentation on The View from the CMO's Office. I hope she returns to eMetrics, because she's got an important message we should all be listening to as we attempt to capture the attention of our CMOs. Those who know me know that I love to meet people, and I always stay up late in the Lobby Bar, talking shop while eating fine Belgian chocolates. I recognize that networking is one of the primary reasons that people attend conferences, and there were plenty of opportunities to do so at eMetrics (not just in the Lobby Bar). My personal favorite networking event, Web Analytics Wednesday, was as lively and well-attended as always - thank you Coremetrics, WebTrends and eMetrics for generously sponsoring us. After years of rogue and covert operations we were honored to have WAW make it onto the official eMetrics agenda for the first time. That's Janet Park (WAA Membership Committee volunteer extraordinaire) on the left, introducing herself to June Li (my doppelganger, the "other" June of web analytics) on the right. If you went to eMetrics DC, lucky you - I'm sure that you left feeling as inspired as I did. If you missed out, I do hope to see you at one of the 2009 events. If any web analytics conference demands - and deserves - complete and utter focus it's X Change. I meant to micro-blog while I was there but as it happened I did not issue a single tweet; I was too busy interacting with the people around me in real life. One attendee remarked that X Change 2008 was a series of panel discussions where everyone was a panelist. Whatever it was, it worked, I learned a lot, and I had a great time doing it. They were all excellent. Every single one was a productive and lively conversation. Along with other X Change staff members I took copious notes during the huddles; we'll be compiling everything into a conference proceedings document, so stay tuned for details. Aside from the actual huddle business there was plenty of time for socializing and fine dining, with expertly organized formal gatherings on both Sunday and Monday night. These events were naturally capped off by late-night lobby bar excursions. Yes I was there. On Tuesday night, after the official conclusion of the conference, I hosted my own event for conference-goers and locals alike - Web Analytics Wednesday. Thank you Unica and SiteSpect for providing this month's sponsorship. As proof that we have arrived, WAW got mentioned in everybody's favorite tech gossip blog, Valleywag. While I am a little relieved that X Change has ended (whew, I can rest!) I am already looking forward to next year. Gary Angel and Eric Peterson, thank you for making this happen. I have created a LinkedIn group for X Change 2008 attendees so we can all stay connected. If you were there, please join. More X Change pictures on Flickr here. Have you heard? The X Change web analytics conference is coming up in San Francisco on August 17-19, 2008. At X Change you'll share the table with seasoned practitioners, vendors, consultants, bloggers and industry experts without feeling like you're subject to a formal speech or a sales pitch. You'll all have an equal stake in the conversation, thanks to the small-group discussion "huddle" format. You won't just be an attendee, you'll be an active participant. X Change will be held at the Ritz-Carlton in San Francisco. It's a classy place and the service is phenomenal. Our discounted room rate of $329 USD per night is only available through June 30th. If you want this rate you must reserve your room before the end of June; the discount code will be provided when you register for X Change. Members of the Web Analytics Association are eligible for a 15% discount to X Change. Use the code "XCWAA15" when you register for the conference. If you are not a member of the WAA, I most certainly encourage you to join today. Event discounts are among the many benefits of membership. Wish you could come to X Change but lack the funds? Well, this year we are awarding a scholarship - including conference admission, a room at the Ritz and reasonable travel - to one talented individual, possibly you. Read the scholarship details and get started on your essay. The conference will be a great place to network, and the scholarship will make an impressive addition to your resume. If you've got any questions about X Change you can contact me directly at <june@semphonic.com>. See you there! Tom Davenport’s keynote was inspiring. He communicates what we’ve known all along – the importance of analytics - straight up to our executives. Jakob Nielsen’s presentation was captivating. His videos of user testing sessions drew laughter; we can all relate. Industry Insights Day was 100% worthwhile. Sharp minds; lively conversation. Similar in spirit to X Change. Zero newsworthy vendor announcements. Google Analytics unveils “almost” real-time processing. Ho-hum. WAW was a smashing success. My super co-host Eric Peterson applauds the feat – and fête. Our Twitter backchannel was a fun experiment. Let's do it again, Clint. I get to speak. James Gardner and I will do a modified reprise of the presentation we gave at eMetrics DC last fall, and we'll be sharing the hour with the inimitable Dylan Lewis and Mark Brooks. The four of us have worked out a nicely-coordinated set of talks focused on career development and staffing in web analytics. Read about our track. I also get to listen. With gusto I will attend as many sessions as I can. After the conference I'll do a write-up on my blog. If you just can't wait that long I may also post some juicy tidbits on Twitter (tsk, Twitter) so feel free to follow me. And I am throwing a big party. Have you not heard? 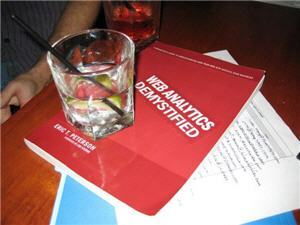 Web Analytics Wednesday happens on May 6th and you're invited. Muchas gracias to Eric T. Peterson, David Rogers, our fine sponsors (Coremetrics, SiteSpect, ForeSee, Tealeaf and eMetrics), our super volunteers and every single participant. Sign up now if you haven't already. We already have more than 160 web analytics professionals signed up to attend! If you're attending eMetrics and you'd like to meet, please introduce yourself - I still look like the picture on my blog, except I have a new short haircut. If you are in the vicinity but you can't spring for an eMetrics ticket, don't despair! There are 3 associated free activities during the week: Web Analytics Wednesday, the WAA Raucous Caucus, and the eMetrics Expo-Only pass. 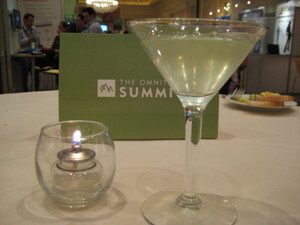 Here's to eMetrics. It's going to be a busy week but a lot of fun. Seth Godin, in his masterful and highly entertaining keynote presentation at the Omniture Summit, made the point that marketing should be considered in relation to any business activity rather than as a cherry on the top. We need to rethink our definition of marketing, he says. Perhaps, when we express concern that web analytics has been "hijacked" by marketing, we're really just thinking about the old definition of marketing, not Seth's new one. The presentation included some very practical examples for building a community of content contributors, although it was all based on the assumption that the UGC activity actually occurs on your own site. This is not always the case. Reviews happen everywhere, ratings happen everywhere, media uploads happen everywhere. If you are only focused on measuring on your own site activities you are missing a big chunk of the action. See Dennis Mortensen's great post on the Online Business Measurement Quadrant for more on this topic. I've written about Flickr stats in the past, and I intend to continue writing about UGC measurement. When I walked in 10 minutes late the powerpoint slide on the screen read, "Reporting Web Services: So easy, even a marketer can do it!!" This new API is bidirectional - you can push data into SiteCatalyst and also pull data out. I thought the push component was interesting, but by the time I arrived, and through the rest of the hour, the presenters were discussing how to pull data out. Make Mac dashboard widgets, create Flex applications, the sky's the limit. Developers in the room were salivating. There were a lot of questions about billing, which is based on somewhat nebulous "token" usage. Everyone told me that this would be a highlight of the Summit, and it certainly was. Brett Error, the ironically-monikered Omniture CTO, lead a town hall session where audience members got to suggest product improvements. Maybe it's a sign of our field's maturity: most of the suggestions were either quite minor or already available (but perhaps not obvious enough). My favorite suggestion was the ability to see the open rate for executive reports sent via email. Laughter from the crowd; it's an issue we all face. A number of other web analytics bloggers attended Summit, so you should read their accounts, as well: Stephane Hamel, Manoj Jasra and June Li (my doppelganger). "This," arms spread wide, gesturing to indicate the expanse of our meeting hall, "must be the largest gathering of web analysts I've ever seen in one room." If there's a theme to the conversational buzz at the Omniture Summit, it is the formidable size of our crowd. 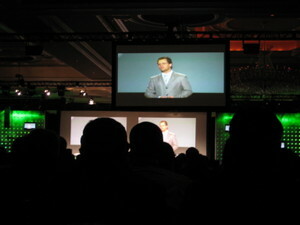 Omniture CEO Josh James, in his welcome address this morning, said that there are over 2000 people here at the show. My favorite part of the morning session was a live demo of newly-released SiteCatalyst 14. 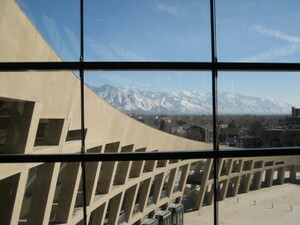 New features drew hoots and hollers of genuine approval from the audience. Of note: Sparklines! Ajax calendar! Tighter link between SiteCatalyst and Discover! Also a nice demo of Search Center highlighting useful data integration at the upstream (keyword buying) and downstream (ie Salesforce or other Genesis Partner) endpoints. 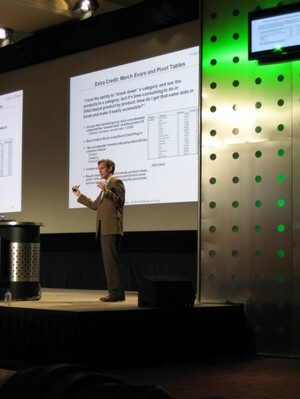 In the afternoon I went to a well-attended session entitled, "Think Big: Using Analytics to Win in Today's Economy." The thesis was, those who continue to spend money on marketing during a recession will become more competitive. I wasn't entirely convinced by the argument, but so be it. As an industry I think we'll be talking about this subject a lot more in the year to come. Josh James on the jumbotron. Am I the only one who thinks he looks like a young David Letterman? David Yoakum from the Gap, speaking in the Retail Industry Track. 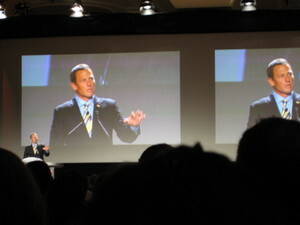 Lance Armstrong, who told an incredible story about his fight with cancer. I neglected to bring my camera to the Flight of the Conchords show, but it was great. Nametag-wearing conference-goers gave an exceptionally enthusiastic round of applause for the binary solo in the robot song. On February 6 and March 12 (and onward, monthly) I will gladly participate in my favorite local event, Web Analytics Wednesday. On the agenda for February: a trip to the movies. We're going to see Untraceable, the newly-released web analytics thriller that Ian Thomas filed under "humour" on his blog. Thank you Web Analytics Demystified, Inc. for providing this event's sponsorship. Stay in the loop regarding San Francisco Bay Area WAW events by joining our Yahoo! group and/or Facebook group. We cross-post all announcements. Also, if you have attended WAW in the past and can vouch for how much fun it is, please share your experience on the WAW site. Oh, and I'm online 24-7: fellow web analytics consultant Anil Batra has just published an interview with me on his blog.